Is one recipe better than the other? Obviously... the cooking temperature matters also. The other week, there was a Pancake Day celebration. iHOP was on Sacramento TV Channel 31 Saturday morning show. The spokesperson pointed out that their success is that they use very cold water or milk or buttermilk... I can't quite remember and cook at 350'F. That got me interested to try it. I have been testing the scratch Pancake many times. What I am looking for is the Cake like thick pancake that I enjoy in Japan. They call it HOT-O-CAKIE. Most of the "American" pancake is very close to flapjack thin, and I dislike the taste of Baking Soda. Recipe by Jessie Damuch - BA's Best Buttermilk Pancakes. The recipe is posted it there. Please get the recipe from there. 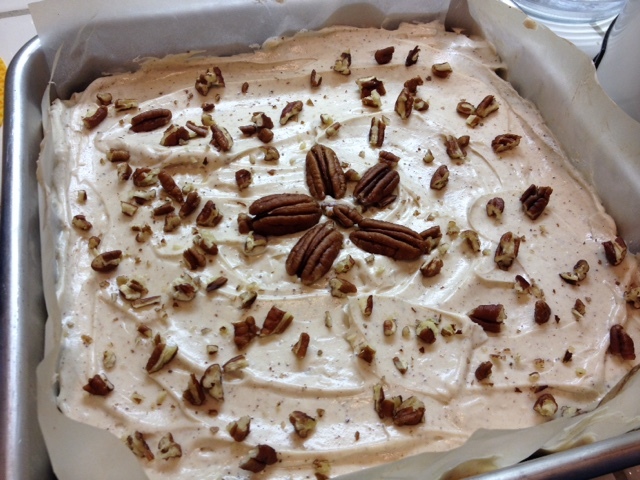 If you are interested in seeing my full modified recipe, please let me know. My modification is the batter 'lump' size. With my method, my batter's lumps are quite smooth. I've tried this 'some lumps' and end up with finding unmixed flour when cutting in to eat. After my first testing, for 2nd batch, I decided to reduced the amount of baking soda to 1/2 tsp to avoid soda smell that I dislike. I have to find my scratch note somewhere in the kitchen to see what I exactly changed. At 350'F, it browned too quickly. But nice lift. I used electric griddle to control cooking temperature at 325'F. The first testing at 350'F caramelized the batter too quickly because of the sugar content in the batter. Coat lightly surface of the non-stick griddle with thin layer of EVOO. Preheat the griddle to 325'F. 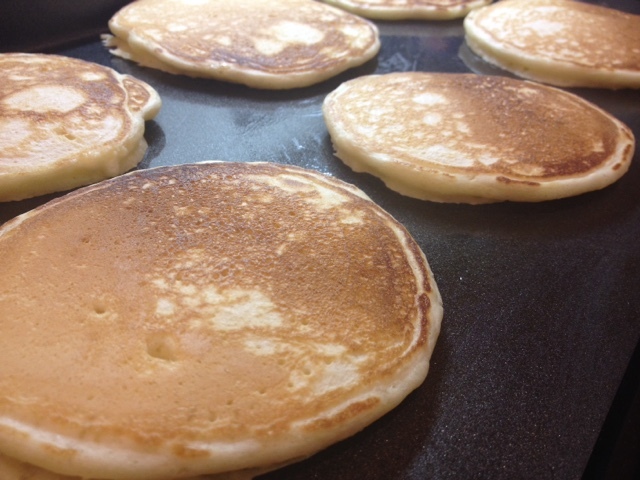 Dispense the batter over the griddle - even size and even space. Watch the cake puff up. Turn it over when you detect some browning. Many recipe says to turn it over when you see the top of the batter bubbling. That's a good tip, too. But, then, again, it won't hurt to check because cooking temperature could vary when many cakes are on top of the griddle vs single cake. Recoat the griddle with thin layer of EVOO before cooking the next batch. The third batch - Perfect! This is my photo journal of my adventure in Zucchini pecan cake with cream cheese frosting. Coarse grind Pecans. Reserve some for topping. Prepare frosting while baking or while the cake is cooling. Cream cheese, milk and powder sugar. I added vanilla paste for extra flavor. I don't know what it is about a movie with a child, mother, and kitchen. The look of satisfaction on the child's face, and glance of mother making the food or just merely a smile of joy and satisfaction of a child before a food make a great impression upon me. I watched the movie UNBROKEN just recently. I saw the main character as a boy watching his mother making the gnocchi. Flour and egg, and smile of mother and child when their eyes met. Wow! that must be some great food! the main character described his mother's Potato Gnocchi as the "pillow soft". It impressed me so much that I had to try. And to my own surprise, it turned out great and it is pillow soft. Here is my photo journal of it. My modification: Scrub potatoes clean. Then, poke some holes in each. Place potatoes in a pot with cold water. Bring water to boil, then, bring the heat to low to “simmer” with lid on. Test with fork for doneness after 40 min., etc. Remove from the pot. Peel potatoes while they are still warm. Let the potatoes cool. Pull apart potatoes into large chunks to fit into Ricer. Press the potatoes through. Use metal blade in the Food Processor. Place flour and potatoes into food processor. Add beaten eggs, olive oil, fresh herbs, Parmesan cheese, bread crumbs. Pulse mix until everything is well mixed. Roll into 1 inch diameter snakes. Cut with Pizza cutter 1 inch wide. Place on a floured tray to dry a bit before cooking. Or place on a toaster oven tray and insert in a plastic bag to freeze. Then, remove the tray. Bring a pot of water to a rolling boil. Prepare the sauce while waiting for the water to come to boil. Cook gnocchi. Gnocchi would sink to the bottom of the pot.. Gently stir to help unstick from the bottom of the pot, then, they float up. Cook one more minute. Scoop them out onto a strainer. I used potato ricer to process the cooked potato. As it is already pretty late in the evening, I decided to use the technology - my food processor. I used the metal blade to cut the dough rather than then short blade for the dough making. Didn't have all the fresh herbs the recipe called for, but I had parsley and thyme. I wanted to rest these cut gnocchi for a while, but I did not have the time, so I cooked it not too shortly after when a pot of water came to boil. I used my cooking basket. I was concern that moist dough would fall apart in the boiling water. On the contrary, they hold the form. Didn't have time to make the homemade sauce, so I used organic sauce from a jar. Next time, I will be sure to make from scratch. Yum! they are "pillow soft"!